Steve Reoch at All Ocean Yachts brings news of a $1 million price cut on the 64m explorer yacht Atlantis II. Famed for her exploration of the Titanic shipwreck, Atlantis II recently completed a major refit which included servicing and upgrading of all systems and equipment. Seven decks include a top deck skylounge with a bar, 42” flat screen TV, numerous sofas and a piano. The dining room has a fireplace and seating for 30. 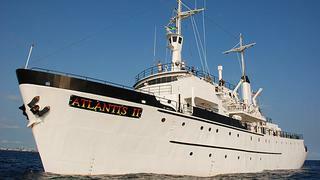 There is a conference room, and the ship is equipped with telephone, Internet, fax and satellite TV systems. Available to view in South Florida, Atlantis II is down to $3,950,000.